Since the event started with the screening, I'll start with that too! A crash landing leaves teenager Kitai Raige (played by Jaden Smith) and his legendary father Cypher (played by Will Smith) stranded on Earth, one thousand years after cataclysmic events forced humanity's escape. With Cypher critically injured, Kitai must embark on a perilous journey to signal for help, facing uncharted terrain, evolved animal species that now rule the planet, and an unstoppable alien creature that escaped during the crash. Father and son must learn to work together and trust one another if they want any chance of returning home. When I found out that the movie was based on a story presented by Will Smith (based on a television show called I Shouldn't Be Alive), and was directed by M. Night Shyamalan, I was definitely curious, it's described as a 'scary sci-fi' flick and you all know that horror is my favorite movie genre! And you have to figure if it's a summer movie blockbuster where the world needs saving then you need Will Smith for sure, but unfortunately butterflies I'd be doing you a dis-service if I didn't warn you to SKIP IT. M. Night peaked with The Sixth Sense as far as I'm concerned. With all of his movies since The Sixth Sense, I set out to the theater with hope it will be, well good.....and the movies have just all fallen short for me, and this one is another one, you leave wondering where the 'meat' was. I did like that you see a Father and Son who come together and learn about themselves and each other in the process, but it's just predictable and that's the nicest thing I can say about it. I appreciate the Q&A because it gives you the juxtaposition of the characters they portray and their real life Father/Son dynamic. Will is learning to allow Jaden to become his own man, even when their Fashion Tastes differ, which was the highlight of the Q&A when someone asked Jaden about his 'Skirt/Kilt' and Will ribbed him lovingly along with the audience. They were also asked if we can expect a movie featuring the entire family and Will mentioned that this is something that they have been considering for awhile now, but teased that they would have to work it around daughter's Willow's schedule. 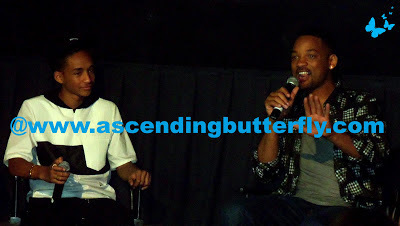 Will Smith is always personable and down to earth so the Questions and Answers was fun. But the movie just falls short for me. 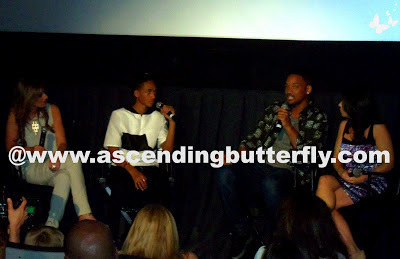 If you do go to see After Earth, please come back and share with us you thought! FTC Disclosure: This is not a sponsored post. This is NOT a compensated post. I attended a screening and questions and answers session hosted by The Moms, I was under no obligation to share my movie review and all opinions expressed herein are 100% my own. 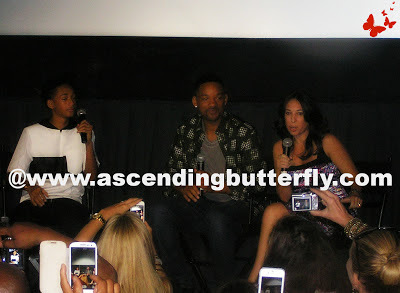 I went to see After Earth yesterday and I really didn't care for it ,it was like a lovely meal with no seasoning.I'm a fan of Will but After Earth didn't do it for me though it's good to see father and son working together Jaden needs energy more of a spark to bring his character to life. @Big Happy Buddha - Same here, I whole-heartedly agree!